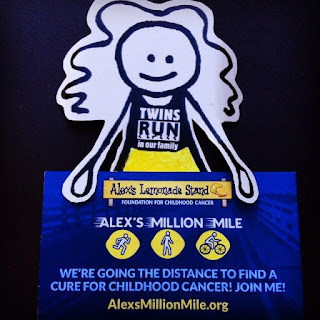 TWINS RUN in our family: Alex's Million Mile: Run. Walk. Ride. Alex's Million Mile: Run. Walk. Ride. Join us on our Journey to a Million & Beyond! 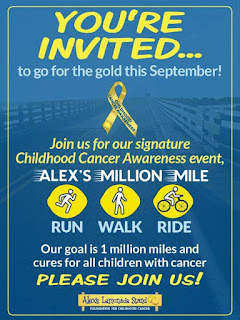 Last year, more than 12,000 people logged miles as part of Alex's Lemonade Stand Foundation's 2nd Annual Alex’s Million Mile event to raise funds and awareness for childhood cancer during the month of September (Childhood Cancer Awareness Month). This year we’re getting ready to do it again! To find a cure for childhood cancer, we’re going the distance – running, walking or biking one million miles and beyond. That’s a long way, but the way we see it, a parent of a child with cancer would go that far (and then some) to find a cure. Kids with cancer need your help! 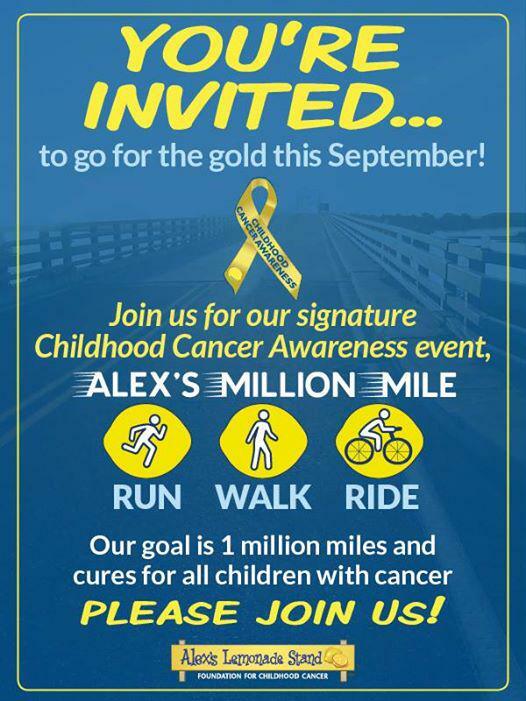 The goal is to collectively run, walk and/or ride one million miles during a single month: September, Childhood Cancer Awareness Month. Our goals are to exceed a million miles, raise awareness and find cures for childhood cancer. Anyone, anywhere can join and fight childhood cancer! • Do I have to do this myself? Nope, you can choose to participate individually or you can start or join a team for added fun and motivation. • How many miles do we have to complete? There is no minimum, or maximum. You complete miles at your own pace. Every mile you log during September counts! • So, why one million miles? One million miles is 40 times around the equator or two round-trips to the moon. But it’s less than five miles for each kid or adolescent who will be affected by childhood cancer this year, worldwide. Childhood cancer is the leading cause of death by disease in children under the age of 15 in the United States. That’s why it is vital that we raise money to cure it, now. We hope you'll join us on our #Journey2aMillion!